If you're interested in running Mac OS X, but you don't want to pay ridiculous prices for a normal Mac, then a Hackintosh just might be for you. Right now, the newest iteration of OS X is 10.8, known as Mountain Lion. In this guide, we'll show you how to install Mountain Lion on your PC with the iAtkos distro. 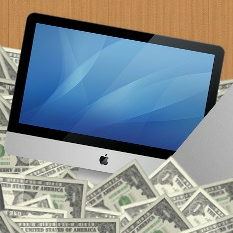 We've previously covered how to install Mountain Lion on a PC using tonymacx86's Unibeast tool, which requires you to have an existing Mac OS X installation. This usually means that you have to install Snow Leopard on your PC first, or find a real Mac. 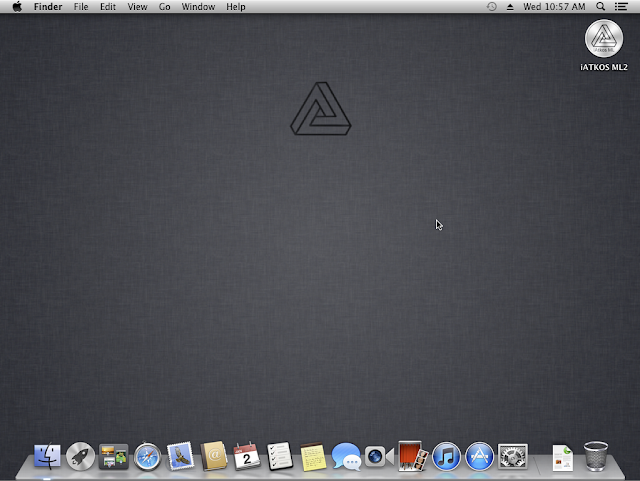 However, with a "distro" like iAtkos, you can jump straight to Mountain Lion. Distros are pirated copies of Mac OS X that have been modified to work with a PC. If you don't have any qualms with the legal issues regarding distros, they're actually the most convenient way to set up a Hackintosh. An existing Windows computer/Mac/Hackintosh: This is the computer where you will download and set up iAtkos. Either Windows or Mac OS X will work. If you're using a Windows computer, it needs to have a DVD/Bluray burner (just about every DVD/Bluray drive nowadays can act as a burner, too). A Hackintosh-compatible computer with 10 GB+ of free space: This is the computer where you will install OS X Mountain Lion. It can be the same computer as the one mentioned in the previous point. 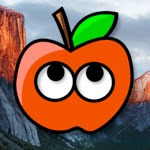 If your computer already has Mac OS X Lion installed, iAtkos will just update Lion to Mountain Lion normally, without deleting any of your apps or files. However, not every computer will work with Mac OS X. Be sure to read the Hackintosh compatibility guide very carefully, to check whether or not your computer qualifies. Also, OS X Mountain Lion takes up about 10 GB of space on its initial installation, so the computer where you install Mac OS X must have at least 10 GB of space in its hard drive. However, that's only the bare minimum; if you plan to install Mac OS X for day-to-day use, I recommend allocating at least 50 GB of space. 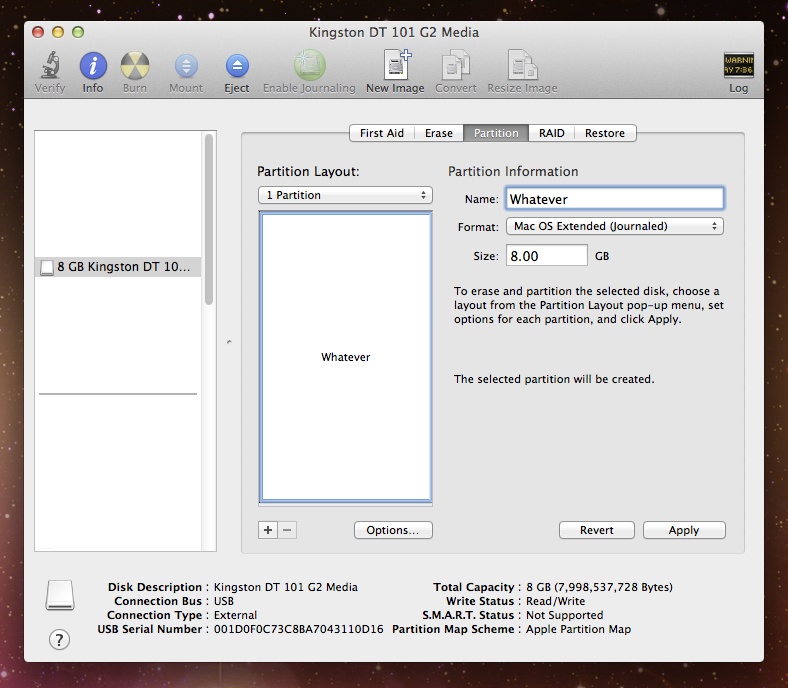 It's preferred that you use a completely empty hard drive for this, but if your computer already has Windows installed on your hard drive, be sure to create an appropriate hard disk partition for OS X Mountain Lion beforehand (by following Step 1 of our guide to MBR partitions). iAtkos ML2 (Free): iAtkos is by far the most popular distro of OS X Mountain Lion. I won't go into details, but you can download it from just about any bittorrent website by using a bittorrent client (it's about 5 GB in size). The standard method of installing Mountain Lion on a PC requires you to modify a retail copy of OS X Mountain Lion with Unibeast, but iAtkos already does all of this for you. In this guide, you will write iAtkos onto a USB drive or DVD, and boot your computer from iAtkos to install Mac OS X. This guide describes how to install iAtkos ML2. You can also use iAtkos ML3, an updated version that only works with motherboards with UEFI. If you're not sure which version to use, just use ML2. A dual-layer DVD, Bluray disc, or empty USB drive (8 GB or larger): If you are setting up iAtkos from Windows, you have to write iAtkos onto a dual-layer DVD or Bluray disc (normal DVDs don't work because iAtkos is slightly too large). However, if you're setting up iAtkos from Mac OS X, you can use a 8 GB or larger USB drive instead of a dual-layer DVD. You will need to erase all of the files on your USB drive beforehand, so make sure to back up its contents first. You can reuse this USB drive for normal stuff after you finish installing Mountain Lion. You cannot write iAtkos onto a USB drive from a Windows computer. If you really want to use a USB drive from Windows, install Mountain Lion on a virtual machine and set up an iAtkos USB drive on there instead. Be sure to install the Virtualbox Extension Pack to view USB drives from your virtual machine. TransMac ($48, 2-week free trial): If you're using a Windows computer to set up iAtkos, you need to use TransMac to write ("burn") the iAtkos disk image file onto your dual-layer DVD or Bluray disc. You don't actually need to purchase TransMac; the free trial works fine. Carbon Copy Cloner ($40, 2-week free trial): If you're using a Mac to set up iAtkos, you need to use Carbon Copy Cloner to write the iAtkos disk image file onto your USB drive. 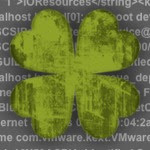 You don't need to actually purchase Carbon Copy Cloner; the free trial works fine. Multibeast (Free): Multibeast is a collection of kext files that your Hackintosh will need to run properly, after the initial installation. If you're using a Mac to set up iAtkos, you will also need Multibeast before the initial installation. Be sure to download the newest version 5 of Multibeast, not the older versions 3 or 4 (which are for Snow Leopard and Lion, respectively). Follow this step if you're setting up iAtkos on a Mac or existing Hackintosh. 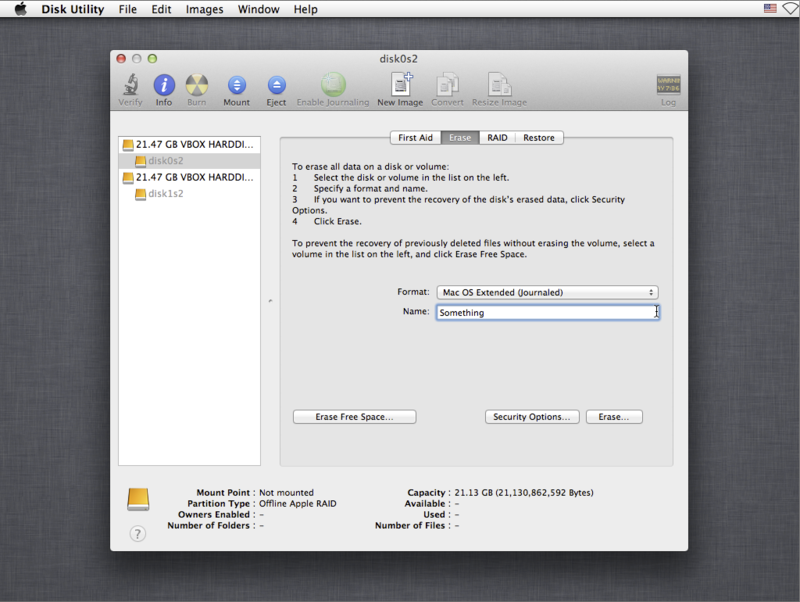 Plug your USB drive into Mac OS X, and open Disk Utility (located in the Utilities folder in the Applications folder). Select the USB drive in the sidebar of Disk Utility, go to the "Partition" tab of Disk Utility, and create a new partition layout with 1 partition. Set the format to "Mac OS Extended (Journaled)". Name the new partition whatever you want. Click the "Options" button before applying your new partition layout. It should be set to "Master Boot Record" by default. Keep it that way. Then click "Apply". 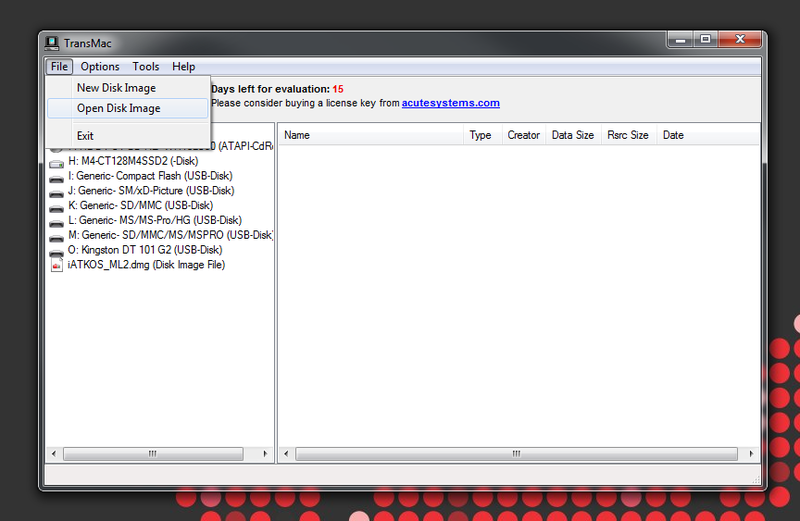 Open your downloaded iAtkos disk image by double-clicking it; this file will probably be named "iATKOS_ML2.dmg". 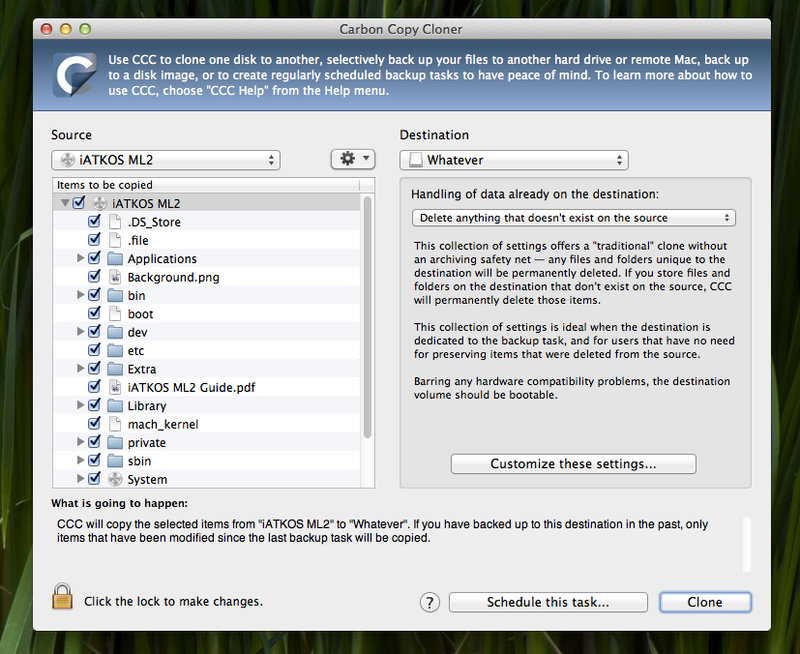 Then, start Carbon Copy Cloner, and set the iAtkos disk image as the "Source" and your USB drive as the "Destination". In the screenshot below, my USB drive is named "Whatever". This will write all of the contents of the iAtkos disk image onto your USB drive. This will take 15 minutes to an hour, depending on the quality of your USB drive. Once Carbon Copy Cloner is done, your USB drive will contain a fully-functional OS X Mountain Lion installer. However, it's still unbootable on PCs. To fix this, open Multibeast and select the USB drive as the installation location. 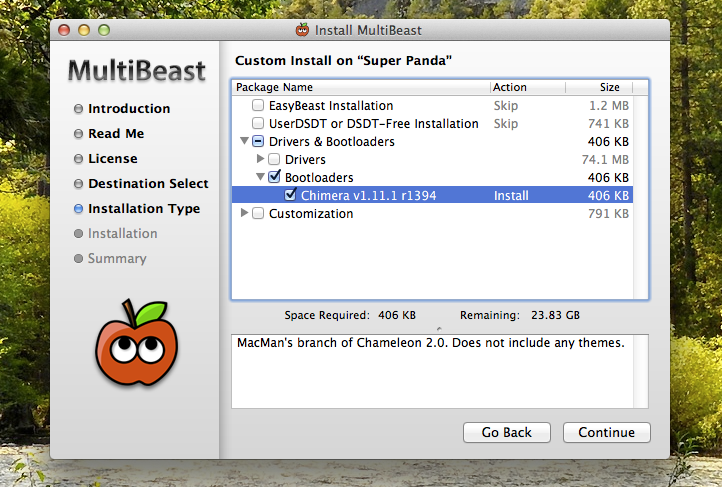 Select Drivers & Bootloaders -> Bootloaders -> Chimera, and run the Multibeast installer. NOTE: If Multibeast doesn't give you the chance to choose the installation location, click past the pages in Multibeast, until you reach the page with the "Change Install Location" button. Follow this step if you're setting up iAtkos on Windows. Insert your dual-layer DVD into Windows, and open TransMac. Click File -> Open Disk Image. In the Windows Explorer window that pops up, select your downloaded iAtkos disk image; this file will probably be named "iATKOS_ML2.dmg". Your iAtkos disk image will pop up in the left sidebar of the TransMac window. Right-click on it, and click "Burn to CD/DVD". Then burn the disk image. This process may take up to an hour (or more, depending on the speed of your DVD burner). 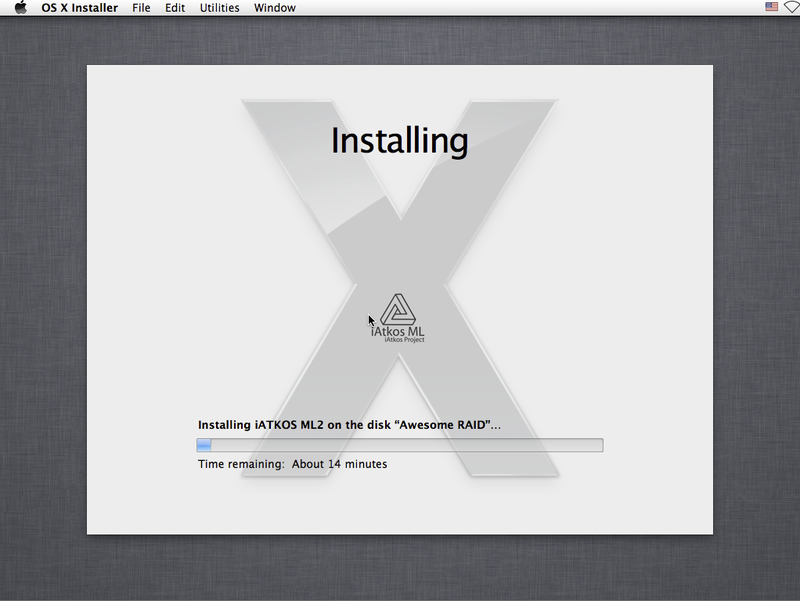 Once TransMac finishes, you will have a fully bootable DVD version of the iAtkos Mountain Lion installer. Boot Device - If you're using an iAtkos USB drive, change the boot device of your computer so that "USB-HDD" is first. If you're using an iAtkos DVD, change "CDROM" to first. You need to do this for iAtkos to work. After you finish installing Mac OS X, you should change this setting back to default, so that "Hard Disk" is the first boot device (this optional, but it will speed up your boot times). Plug your iAtkos USB drive into a USB 2.0 port on your computer (USB 3.0 doesn't always work), or insert your iAtkos DVD into your DVD drive. Restart your computer. If things go well, your computer will boot into iAtkos instead of booting from your normal hard disk. You will then be able to view the iAtkos menu. If you do not manage to reach the iAtkos menu, check your motherboard's BIOS settings to make sure that the changes you made in Step 3 were properly applied. If they were, but you still cannot boot from iAtkos, go back to Step 1 of this guide and try again with a different USB drive or DVD. 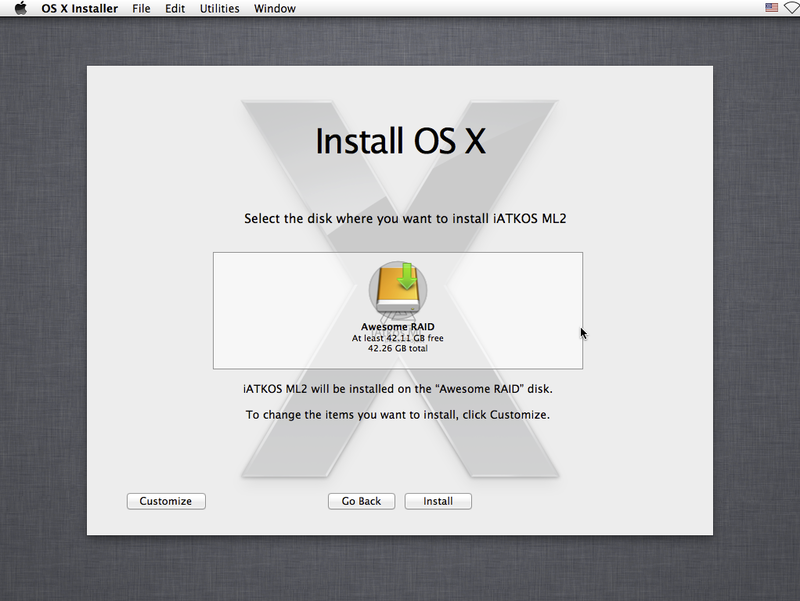 At the iAtkos menu, select the name of your iAtkos USB drive/DVD, by using the left/right arrow keys on your keyboard, and then press the enter key (or return key) to start the OS X Mountain Lion installer. To enter boot flags, manually restart your computer by pressing your computer's power button. Then, once you've booted back into the iAtkos menu, try typing any necessary boot flags before pressing the enter/return key. Check out this list of common boot flags for reference ( PCIRootUID=0 and -x are two popular boot flags). 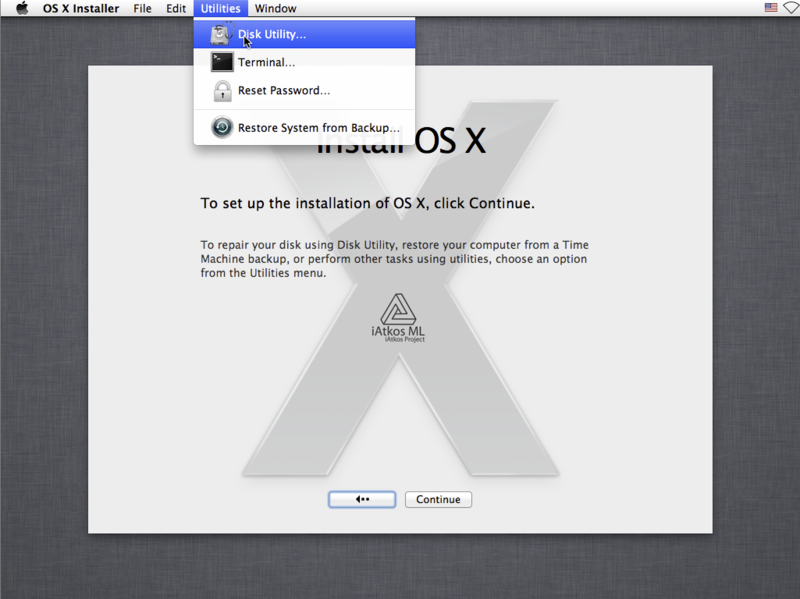 You need to use Disk Utility to erase a hard drive partition so that OS X Mountain Lion can install itself on it. In the sidebar of Disk Utility, choose the hard drive partition where you want Mountain Lion installed, and erase it by using the "Erase" tab. You can also just erase the entire hard drive (this is the preferred solution if you don't plan to dual-boot Windows and Mac OS X from the same hard drive). In the screenshot below, my hard drive partition is called "disk0s2", while my entire hard drive is called "21.47 GB VBOX HARDDRIVE". Mac OS X cannot boot from a partition that's larger than 1 TB in size, so if you have a 2 TB hard drive, you will have to partition it. Unlike the default OS X Mountain Lion installer, the iAtkos version of the Mountain Lion installer works with MBR partitions by default. If your hard disk uses the MBR partition scheme, iAtkos will install itself onto there without the need for prior modifications. 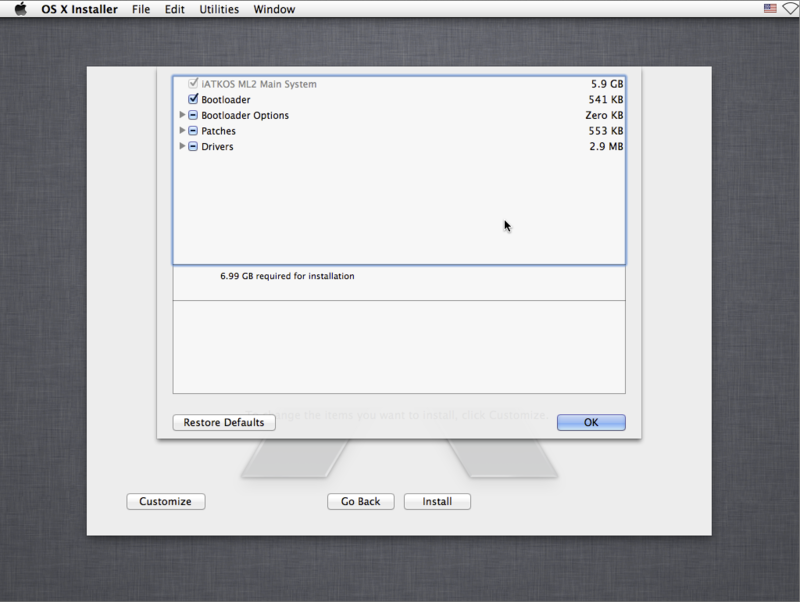 The iAtkos version of the Mountain Lion installer also works with software RAID 0 arrays by default. If you want to set up your Hackintosh's hard disks in a RAID 0 array, simply create an array by using the Disk Utility app inside the iAtkos installer (see Step 1 of our RAID 0 guide). iAtkos will install itself onto there without the need for Steps 2-5 of our RAID 0 guide. On the installation page for Mac OSX, the hard disk/disk partition should now be showing up. Select it, and then click the "Customize" button on the bottom left. This is where using a distro becomes really useful: iAtkos allows you to install extra Hackintosh drivers and kexts, straight from the OS X Mountain Lion installer. The "Customize" page essentially does the same thing as Multibeast, though the layout (and most of the names of the options) are different. However, choosing the right options from this page can be really tricky, so unless you're absolutely certain about which drivers and kexts you need to install for your computer, I don't recommend installing too much stuff from here. The default selection will enable Mac OS X to boot from the hard drive without any assistance; it may also enable sound and ethernet in OS X. For most computers, that will be enough (at least for the initial installation). 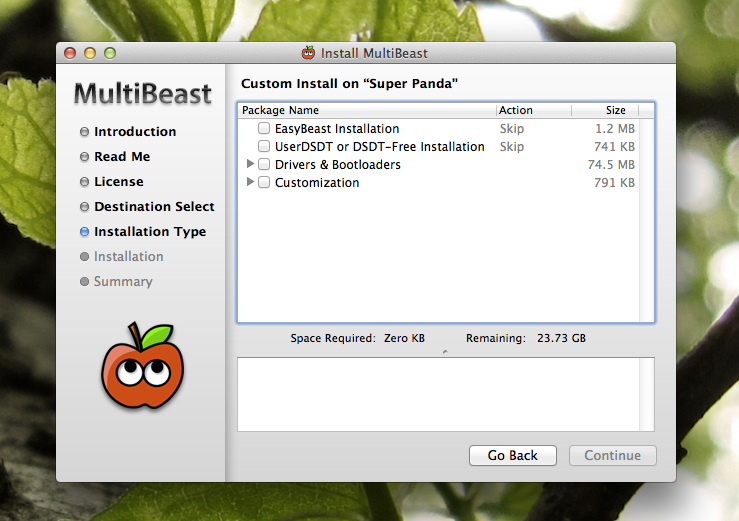 If you wish to install more, refer to our guide to Multibeast. Otherwise, you can figure out the rest in Step 6, where you'll actually set up your Hackintosh with Multibeast. 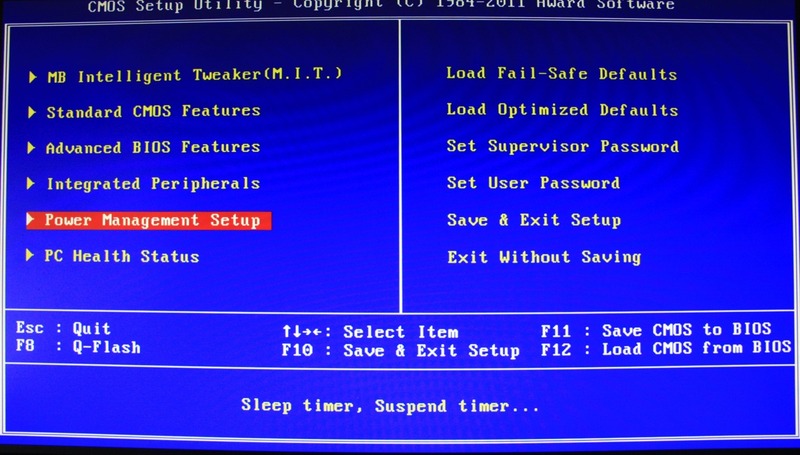 To enter boot flags, manually restart your computer by pressing your computer's power button. Then, once you've booted back into the iAtkos menu, try type any necessary boot flags before pressing the enter/return key. 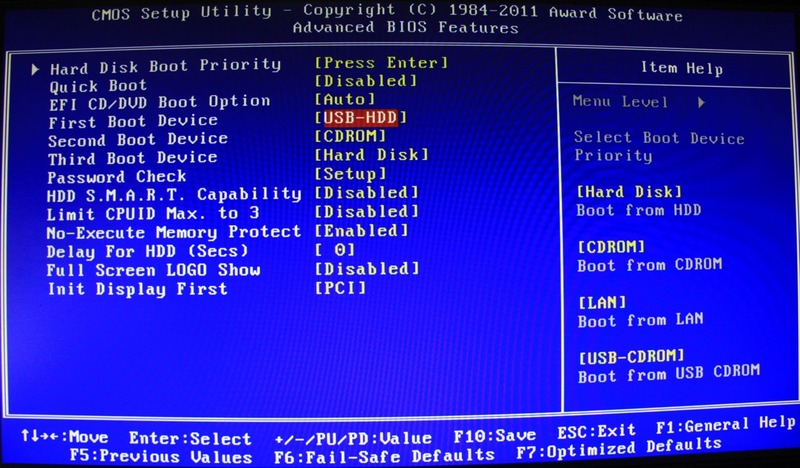 Check out this list of common boot flags for reference ( PCIRootUID=0 and -x are two popular boot flags).